Fitness trackers come in all shapes and sizes, some with specific abilities for sports others with general fitness capabilities for the general public. It can be hard to wade through all the available products to find the one that will do the job you need. Hopefully, this Polar A300 review will be helpful and give you a better idea of what you can expect from this fitness tracker. Whether you need help reaching your fitness goals, motivation to kickstart a healthier lifestyle, or feedback about all the effort you put into your workout, you can find that with the Polar A300. The features available on this fitness tracker are more suited to users that want to get healthier, maintain their current fitness level, or start improving on their already healthy foundation. With the accompanying app, Polar Flow, and the ability to pair with the H7 heart rate monitor, the A300 can record and store your information and provide helpful feedback to meet your goals. The Polar A300 is the successor to Polar’s more general fitness trackers the Polar Loop and Loop 2. While both those trackers just monitor your daily activity levels, the A300 expands and builds on that foundation. You can still track all your movement throughout the day, including steps taken and more intense workouts, but it also helps you develop a training program, meet activity goals, tracks your sleep, and offers smart coaching features. Once you pair it with the app, Polar Flow, you will get all your data which can help you analyze your efforts and fine-tune your fitness. The A300 features a large watch face with crisp and clear images which are easy to read unless you are in a very low-light area. The wristband is comfortable silicone, and you can quickly change the color of the band by popping the watch out. Because the USB is connected directly to the watch face, this is also how you charge the watch and connect it to a computer to sync information. There are no additional plugs or cords you need to keep track of which makes it easier to get your fitness information. 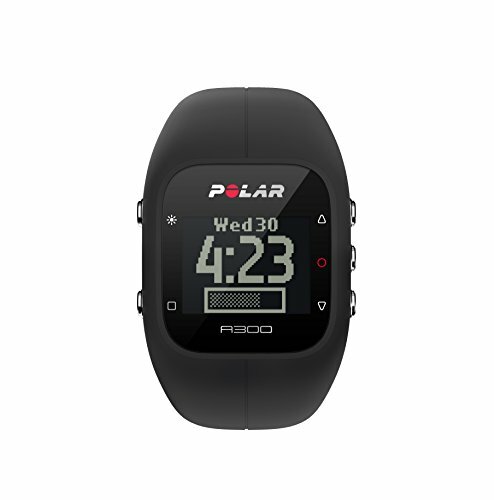 The Polar A300 does have the ability to pair with the H7 heart rate monitor from Polar, but you must purchase that separately from the watch, it isn’t included. If you already have the HRM or buy it along with the A300, you will have access to even more information and feedback about your health. During your workouts, the HRM will continuously check in with your heart rate so it accounts for every movement and you can access the smart coaching features. The smart coaching you can get with the A300 includes an activity guide that gives you a look at your activity through the day. You can also see a compilation of your activity daily, weekly, and monthly and the app will show you how your efforts benefit your health. Your watch will also vibrate if it detects that you have been inactive for 55 minutes or more. These reminders help keep you moving and active which all add up over time. This tracker can also monitor your sleep and give you information on when you fall asleep and how often you wake up during the night. You can set your watch to wake you up instead of your alarm, and the accompanying vibration is a much subtler way to wake up than a loud blaring beep. Don’t worry though; the vibration is enough to help you wake up. Your sleep information also gets sent to the Polar Flow app so you can accurately track your rest. While there is no GPS included with this tracker, it’s ability as a fitness tracker is fantastic. This will help any user out there that wants to improve or maintain their fitness level achieve their goals with ease. The large screen makes it easy to read your activity stats, and the backlight also makes it easier to read when it is dark out. The A300 sends all your fitness information to the Polar Flow app which means it is easy to track your progress, set reminders, create programs, overall hone your fitness efforts to your needs and goals. During a workout, you can see exactly how much time you spent in your fat burning zone and how much time you spent in the fitness improving zone. This allows you to tailor your workout to your needs. You can sync your phone to the tracker to get notifications and reminders, so you don’t always have to check your phone during a workout or through the day. Sleep tracking allows you to see how long it takes you to fall asleep as well as how many times you wake up in a typical night. If you want to get more heart rate information you have to purchase a Polar HRM separately because the tracker and HRM aren’t sold together. No GPS connection which isn’t a problem if you don’t need that feature but runners and bikers might want to utilize those extra functions. The bigger screen is useful for showing more stats, but some people might not want to wear the watch while at the office or out in social situations. The price might be a little high compared to other models that offer more features. While other trackers might offer a ton of features with a wide variety, the Polar A300 knows precisely what it’s built to do: track your activity with high accuracy. Wearing this watch all day means that you can get an accurate readout of your daily activity. This includes the number of steps in your day, intensity levels throughout the day, the distance you covered, and the calories you burned. Once the tracker collects all this information, it sends it to the Polar Flow app, and then the app breaks it down into useful information. You can get a 24-hour breakdown of all your activity, including how many hours you slept and how many hours you spent in intense activity. Being able to see your activity tracked throughout the day gives you a better chance at optimizing your workouts and meeting your goals faster. It also shows you when during your day you might be least active and then you can use the inactivity reminder to move around a little, even if it’s just for a quick walk around the office. It all adds up! Even more helpful than seeing your movement throughout the day is the A300’s ability to track when you are in your fat burning zone and when you are in your fitness improving zone. The Polar A300 uses the EnergyPointer technology that is a part of some of Polar’s other trackers to help you find your unique fat burning and fitness improving threshold. These thresholds are different for each person, so the fact that this fitness tracker can pinpoint your exact limit is fantastic. You can also use these numbers to tailor your workout to your needs. If you want to lose weight you can use the Polar A300 to ensure you stay in the fat burning zone during your workout. On the other hand, if you’re trying to increase your fitness level, you can seamlessly move your workout out into the fitness improving zone. You can use this fitness tracker to get a wealth of information on your health and fitness, which is why it is a good option for those looking to improve their health or get the motivation to start with a workout routine. In addition to the activity tracking mentioned above, the Polar A300 allows you to track calories, sleep, and if you have an HRM or choose to purchase one, you can obtain even more stats. While the tracker doesn’t come with an HRM, if you decide to purchase one or already have a Polar HRM, this will give you the most information as well as a better picture of your health and progress. The A300 syncs with the HRM to continuously track your heart rate during any given activity. The information that the monitor gets through your workout is sent to the Polar Flow app and allows you to tailor your program to your needs. If you want to train for a race, you can set up a program based on your stats to help you achieve that goal. You can also track calories with your Polar A300 and their smart coaching. Based on your height, current weight, age, gender, and your maximum heart rate, the A300 gives you one of the most accurate calorie counters on the market. Another unique statistic you can get through this tracker is their fitness test results. This five-minute test measures your VO2max, a general measure of fitness, and gives you a score. You can periodically check this rating and see how you improve over time with regular exercise. Finally, all this information can be a little overwhelming, but luckily the Polar Flow app organizes everything so you can use the information you get. The app provides charts, graphs, and calendars so you can see progress over time as well adjust your workouts and schedule to optimize your health. Easy to use and set-up- All you need to do to get your A300 ready to go is plug it into your computer. From there it starts charging and takes you through setting up the Polar Flow app. Stylish design- It’s easy to pop the watch face out of the accompanying band, and you can buy assorted colors to match your outfit each day. Fuss-free charging- The built-in USB connection means you don’t have to worry about keeping track of another cord. Detailed activity tracking- This tracker is at the top of the line with activity tracking, and you can get feedback about the steps you took, set up daily activity goals and see your progress throughout the day. You also get even more feedback during your workouts such as time spent in your fat burning zone or fitness improving zone. Ability to sync with heart rate monitor-You can get a Polar HRM and pair your tracker with it to get even more feedback on your workouts and activity. Sleep tracking- Sleep is an important part of your health as well, and the A300 tracks how long it takes you to fall asleep, how long you stay asleep, and any disturbances in your sleep throughout the night. This information can be valuable in improving your overall health. It helps to learn about a product’s features and specifications, but there is only so much website can tell you, especially about how well the product functions. Customer reviews are a great way to see how a product actually works once purchased and can give you a clearer picture on which route to take. So, what do users think about the Polar A300? Here are just a few A300 Polar reviews. The first thing that most customers comment on is the fact that this tracker is one of the best that they have tried when it comes to monitoring their activity. Many customers enjoyed the amount of feedback they got from the A300 and mentioned that this information was crucial to their health and fitness successes. They also liked that they got instant feedback during workouts, so they knew when to push harder or pull back based on their fitness needs. There were just a few problems that users mentioned after they got their trackers. A few people noticed that after software updates certain features had changed or didn’t work, which was mildly annoying. In most cases, they could fix glitches with a factory reset, and only a few had to send their trackers back to get the problem worked out. Others found the initial setup to be a bit difficult due to their operating system, but most could quickly get their tracker up and running. Finally, like most wear all the time fitness trackers, the band can get a little dirty over time. Most customer just used an alcohol wipe to clean things up, and they were good to go. Even with these minor problems, most customers were very happy with their purchases. Those that got the HRM loved the added information and the ability to fine-tune their workout to their needs. They also liked the Polar Flow app and the ability to organize all their information in one spot. Overall, the tracker met or exceeded most user’s expectations. If you are someone looking to improve your fitness or maintain it, this is the fitness tracker for you. It accurately keeps track of your activity throughout the day, including reminding you to move if you have been inactive awhile. It will also show you your progress towards meeting your activity goal for the day. In addition to that, you can track your sleep, calories, heart rate (with the additional HRM), fat burning zone and fitness improving zone. The Polar Flow app keeps your info organized and gives you helpful insights to make improvements in your routine and ultimately reach your goals.